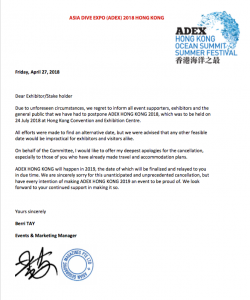 Due to unforeseen circumstances, we regret to inform all event supporters, exhibitors and the general public that we have had to postpone ADEX HONG KONG 2018, which was to be held on 24 July 2018 at Hong Kong Convention and Exhibition Centre. All efforts were made to find an alternative date, but we were advised that any other feasible date would be impractical for exhibitors and visitors alike. On behalf of the Committee, I would like to offer my deepest apologies for the cancellation, especially to those of you who have already made travel and accommodation plans. ADEX HONG KONG will happen in 2019, the date of which will be finalized and relayed to you in due time. We are sincerely sorry for this unanticipated and unprecedented cancellation, but have every intention of making ADEX HONG KONG 2019 an event to be proud of. We look forward to your continued support in making it so.